Is there any precedent for the Cleveland Cavaliers' fantastically successful summer? A massively disappointing team that couldn't even make the playoffs in a terrible conference when actively trying to earn any seed parlayed their geographical location, the vagaries of narrative, and lottery luck into the best player of his generation, another perennial All-Star, and genuine contender status. Sometimes good fortune does more than all the effort in the world. As LeBron James has said many times this summer, it will take time for the Cavs to round into championship form, if only because the key members of his supporting cast have never been in a similar situation. In Miami, LeBron could rely on the championship pedigree of Dwyane Wade and, to a much lesser extent, Chris Bosh's awareness of the postseason — he was even seen as the unsteady one in the wake of his failings against the Boston Celtics. By contrast, neither Kevin Love nor Kyrie Irving have appeared in the playoffs. From one angle, David Blatt, seasoned in Europe but never an NBA coach of any kind, is even more of a question mark than boy wonder Erik Spoelstra was thought to be way back when. Add in the fact that the Heat didn't figure out the best way to use LeBron for more than a season and it's easy to see why the team would preach patience. On the other hand, those concerns figure into what level of contender the Cavs will be, not if they figure into the title mix at all. With Paul George out and Derrick Rose not yet proven as a star after another knee surgery, LeBron and Co. look like the clear favorite to represent the East in the finals. Irving is coming off a stellar World Cup for the gold medalists, Love is as sure a statistical producer as anyone in the sport, and presumably some of the ring-seekers who joined the club in the summer — James Jones, Shawn Marion, Mike Miller, and anyone who joins the team after a trade-and-buyout at the deadline — should stay healthy enough to provide a stable bench. This team has a very high ceiling, especially on offense, but their floor isn't too much lower. Figuring out where they end should be a lot of fun. Blatt is known as a master tactician, which means his solution to the problem of fitting James, Love, and Irving (and, uh, Dion Waiters) into the same offense could open some minds. LeBron's versatility makes him a welcome addition to any situation, but it can also make him difficult to place. It's possible that he'll play in the post, or on the wing, or everyone at once. 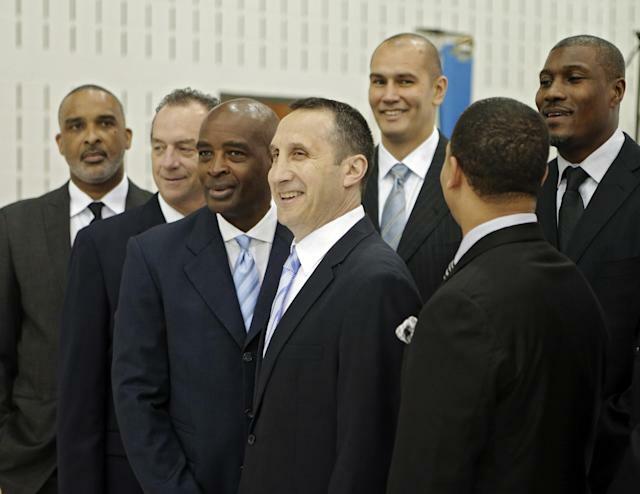 Maybe Blatt will unleash hell upon the NBA and turn the Cavs into a run-first outfit. If they do, how will they balance potent scoring with the need to defend? We have a whole season to see how it goes. I, for one, can't wait. Failing upwards is an art, not a science. The guy who does everything really well. The Cavs are very light on rim protection, to the point where it wouldn't be a huge surprise to see James serve as the team's lead interior defender. Anderson Varejao, Kevin Love, and Tristan Thompson are all fine-to-elite rebounders without shot-blocking reputations, and Shawn Marion is 36, hasn't averaged a block per game since 2008-09, and doesn't figure to play heavy minutes. Losing out on Chris "Birdman" Andersen in free agency could hamper this team significantly. It's a safe bet that GM David Griffin, because it's basically unheard of for championship teams to lack this presence. Dion Waiters has made few fans in his first two years with the Cavs, having teamed profligate shooting with a high usage rate and isolated contributions elsewhere. The fourth pick in the 2012 draft — ahead of Damian Lillard and (more crucially for the Cavs' needs) Andre Drummond, although several teams screwed up on the latter — cannot be the same player on a team with so many other excellent scorers. If he jacks up bad shots while Kevin Love and LeBron James wait, it's a fair bet that he'll find himself on the bench. The Cavs will hope that he learns restraint and turns into a trusted shooter. Most Rookies of the Year/All-Star Game MVPs/Team USA stars have already broken out, and Kyrie Irving has certainly accomplished a lot after only three seasons in the NBA. However, there's a sense that he's only really scratching the surface of his skills, including the ability to turn his individual brilliance into team success. With Love and LeBron now in the lineup, Irving will be forced to focus less on beating teams by himself and more on nuances and how to excel without the ball. He's the rare player with the opportunity to rise to the level of a superstar while seeing his scoring average dip. Blatt and his stars figure out the offense quickly, the defense is good enough until Griffin can add a big man at the deadline, and the Cavaliers roll through the East on their way to the franchise's first NBA title. LeBron doesn't jell with his new teammates, Irving stays the same, Love gets hurt, no interior defense comes, and the Cavs crash out before the conference finals due to a bad matchup.